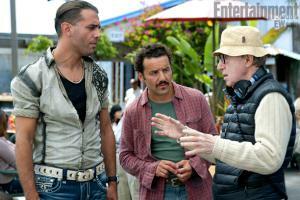 Is Blue Jasmine, Woody Allen’s so-called “return to form” really as good as they say? Whether you like the film or not (I don’t), Blue Jasmine has put Woody Allen back into the conversation in a way that he hasn’t really been since maybe the 1990s. And if we mean a conversation that is only about his films, then maybe the 1980s. The prosaic way to measure the impact is to check the box office. As of the end of October, Blue Jasmine had taken $633,820 in New Zealand and was still playing in art house cinemas in Auckland, Wellington and Christchurch nearly two months after opening. Globally, the take stands at over US $50 million. By any measure, that makes it a hit comparable to Annie Hall, Manhattan, Hannah and her Sisters and Midnight in Paris, which was also a late hit no one saw coming. Midnight in Paris was a trifle, though – another undemanding, half-sketched installment in Allen’s series of tourist rom-coms. Blue Jasmine is ostensibly serious drama with a psychological dimension. But it plays more like a tragedy that has forgotten it should be a comedy. The characters are broad and caricatured but the laughs have dried up. Did the marketing help? Nothing about the poster image of a composed Cate Blanchett set against a blue and white sky shouts ‘‘Woody Allen’’, whose standing fell even below cult status at about the time of Deconstructing Harry in 1997. For most, responses to Blue Jasmine stand or fall on whether Blanchett convinces you or leaves you cold. Was there any point at which you felt actually sympathetic towards Blanchett’s ‘‘Jasmine’’ (really an aspirational Jeanette)? These seem to be the key tests that critics have been applying. What use is tragedy if it lacks catharsis or the possibility of empathy? How many trials can a deluded and humiliated character go through before it turns into misanthropic degradation? Or misogynistic degradation? It’s a tough balance. Most agree that Blue Jasmine is a cover version of A Streetcar Named Desire, updated (but not really) for the age of the global financial crisis. Heading west, Jasmine crashes in the San Francisco apartment of her sister – Ginger (Sally Hawkins) not Stella – pickles herself in vodka and turns her nose up at the chumps she now has to live with. In particular, Ginger’s fiancée Chili (Bobby Cannavale) and his pal Eddie (Max Casella). In flashbacks, she patronises Ginger’s ex-husband Augie (former shock-jock boofhead Andrew Dice Clay in poignant casting) instead. The flashbacks also reveal that her husband, Hal (Alec Baldwin), was a crook running a Ponzi scheme. He even stole the $200,000 Ginger and Augie won on the lottery. Blanchett did Streetcar in New York and Sydney before this, and you suspect that her stage performance was more or less carried over. There is only one point (a late scene, a flashback in a kitchen) in which she steps out of a careful and solipsistic impersonation. For just a moment it stops being stage acting – artificial and exaggerated – and turns into film acting. But Blanchett did what she could. I doubt that Allen really bothers to direct actors anymore (if you want to see Blanchett well-directed, look again at Todd Haynes’ I’m Not There) but this creates tone problems. Her stage performance is dumped wholesale into the flat realism of Allen’s film as he cuts clumsily between San Francisco in the present, and New York/Long Island in the past. Even the most basic stuff – the texture of place, a sense of time passing, clear distinctions between flashbacks and the present – is botched. It’s a highly un-cinematic film. You will realise how much of a contribution cinematographer Gordon Willis made to Annie Hall, Manhattan and Stardust Memories all those decades ago. A more sophisticated director might also have let us entertain the possibility that Jasmine’s memories are unreliable or even fantasies, but for Allen the flashbacks are just big chunks of time dropped into the narrative. Still, Allen’s films are usually little more than rudimentary as exercises in style these days. They’re rudimentary in general. More troubling, for me, is the position the film seems to operate from or the world it takes as normal. The view is downwards from the top of the social ladder. You might expect a story that takes place in the aftermath of the banking crisis to have some satirical things to say about wealth and greed, but instead we get the reverse: it’s so horrible when you have to slum it with the proles. A dated, upper-middle-class view of the world has been standard in Allen films for years – it was there in Midnight in Paris, with its wealthy Americans on holiday (and where the self-absorbed tone was dispelled a little by an amiable and nicely insincere Owen Wilson in the Allen part), and it was the organising principle in Match Point, a cold and almost Tom Ripley-ish story about a ruthless young man who wants in on the good life. In Blue Jasmine, Ginger’s working-class boyfriends are caricatures dreamt up by a snob. It gets pretty judgmental. Neither Allen nor Jasmine can accept that these sub-literate, blue-collar jerks – Chili’s a grease monkey with his name on his overalls, as though this is a 1950s sitcom – are really happy living this way, watching the boxing on TV and guzzling beer. There is no discernible difference between Jasmine’s view and Allen’s, no matter that he probably thinks he is setting her up as an example. She is from his world but she is also punished for daring to aspire to it. In a Guardian interview, Allen talked about how the idea for the story “came from Soon-Yi, his wife of 16 years, who told him about the friend of a friend – the wife of a financier who imploded after learning her husband was unfaithful and involved in Ponzi-ish fraud”. Marry down and you live like Ginger, stuck among the schlubs. In a pretty good year for cinema about the lives of the idle and entitled (The Bling Ring, The Great Gatsby, What Maisie Knew), Blue Jasmine keeps striking the wrong note. Peter Sarsgaard’s character Dwight Westlake – that name! – is the film’s idea of a perfect catch: single, rich, good-looking and happy to leave all the interior decoration to Jasmine. A big, empty house on the bay, or on Long Island, is an image of the good life just as Ginger’s cluttered, noisy apartment is life at its lowest. For Allen in 2013, being out of touch is almost a badge of honour (like Jasmine, he hasn’t even learned how to use a computer). Expelled from Park Avenue, Jasmine “took a place in Brooklyn”, which is supposed to be a synonym for a fate worse than social death, but Brooklyn is gentrified to her liking these days. Doesn’t Allen watch Girls? Lena Dunham is one who has brought the classic Allen persona – anxious, self-centred, ashamed and also shameless – forward a few decades. Noah Baumbach is another. Track Baumbach’s remarkable four-film series that goes from The Squid and the Whale through Margot at the Wedding and Greenberg to this year’s Frances Ha. It’s a better run than predecessors like Hal Hartley and Whit Stillman ever managed. In Greenberg, Baumbach put a depressed New Yorker in sunny California, like Allen in Annie Hall – in this case, Ben Stiller. Like Allen, Baumbach sometimes crafts films with actresses in mind but Frances Ha is closer to Godardian in its relationship to and adoration of star and co-writer Greta Gerwig. But unlike Godard’s Anna Karina films, Frances Ha feels like it was made in partnership with Gerwig. She is not just a subject. Early on, her Frances is every bit as excruciating as Cate Blanchett’s Jasmine but there is an evolution and some interiority, as well as humanity, and the film has more cinematic style in just a few minutes – as in the trip back to Sacramento with Gerwig’s actual parents playing her parents – than Blue Jasmine has in its entire running time. And with New York addresses as chapter titles, it could almost be a version of Manhattan more than 30 years on, in a very different city.